“Wanna know my favorite Green Lantern?” The kid asks, a huge grin spread across his face. As entertained and delighted as I am to see a 5 or 6 year old child tell me his favorite Green Lantern is the hilariously obnoxious one whose heyday was the 80's, the kid has a point. 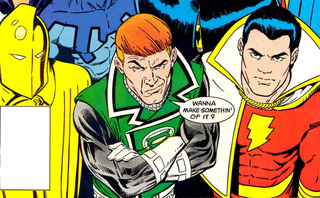 Guy Gardner is a jerk, and that element of his personality has a great amount of value. It makes him stand out, it makes him entertaining, and to a degree, it actually fleshes him out as a superhero, and in doing so it also helps us see the value of people in real life who we might otherwise dismiss due to bad behavior. So I wrote an article about it on Kulture Shocked. Though to be fair, I kind of lied. The best Green Lantern is obviously Arisia Rrab.